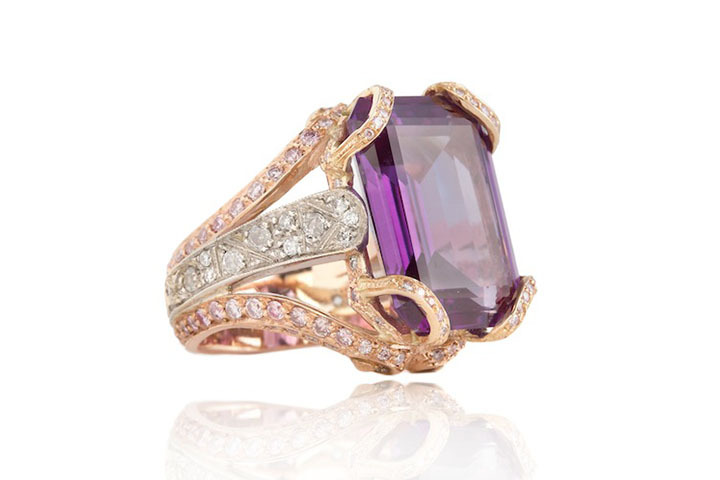 This amethyst and diamond ring was born of an heirloom stone. Ashley’s client received the amethyst from her grandmother, with whom she was very close. When designing, Ashley worked to play off the idea of her client as a young girl spending time with her grandmother: as a result, this piece is elaborate and decadent while being playful and girlish. Pink diamonds flow through rose gold like ribbons woven through hair into a bow. The platinum band with its triangular diamonds is a nod to the nature of a young girl—there is simplicity in the band itself, while the setting of the stones is both playful and whimsical.